A Blog Named Sue: Coolest. Wife. Ever. My Lovely and Talented Wife Who is Smarter Than Me™, upon hearing that the Obamas wanted to adopt a shelter dog: "Lieberman's going to need a home pretty soon." Unbelievably Boorish Guy at Party to My Lovely and Talented Wife Who is Smarter Than Me™: You're a European, huh? I hear you people have a big problem with Muslims over there. My Lovely and Talented Wife Who is Smarter Than Me™ (casually): Only if you're a racist. Sigh. Isn't she the greatest? 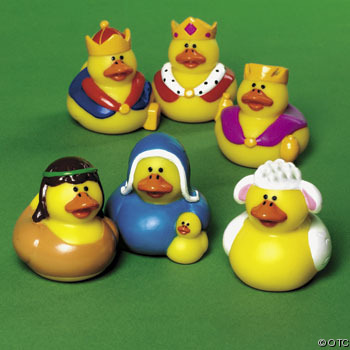 Yep, that's right - they're all rubber ducks. Jesus being the duckling, of course. I haven't put out a Nativity set since I was twelve years old (I think), but I may very well be doing so this year.